Lawrence Halprin Exhibition - Washington, D.C. I am honored to be part of The Cultural Landscape Foundation's (tclf.org) exhibition on Landscape Architect Lawrence Halprin (1916-2009). I was a contributing photographer and my assignment was Babi Yar park in Denver, Colorado (built to commemorate the massacre of Ukrainian Jews in Ukraine by the Nazis from 1941-1943). While I hadn't previously been to Babi Yar park, I had already enjoyed the incredible spaces Halprin created including the Yosemite Falls Corridor in the National Park, Ghirardelli Square and the FDR Memorial to name just a few. The breadth of his work and contribution to the outdoor spaces in this country is staggering. It was a proud moment to see my work hanging in the National Building Museum in Washington, D.C. (www.nbm.org) and a real pleasure to learn about Halprin's work. My favorite part of the exhibition had to be the sketches and dioramas he created of his designs, with colorful and playful details. 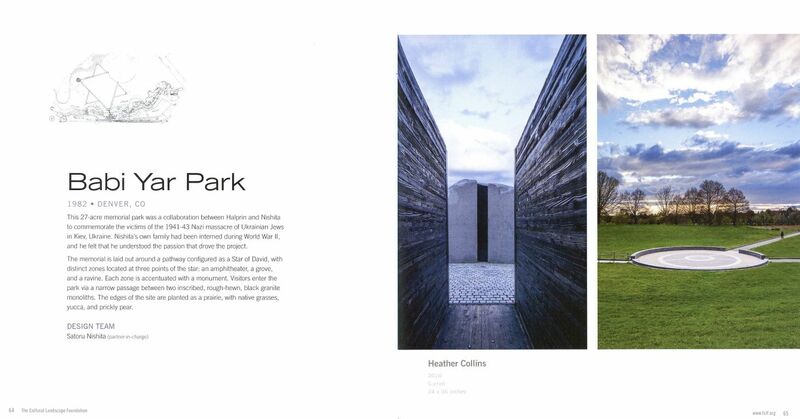 The images included here are mine from the exhibition, as they appeared in the catalog.